As Capital Regiment wheeled its gear toward the 50-yard line last night in Bloomington-Normal, the clouds had already blown near to the stadium. Unfazed, the corps began the opening "New World Symphony" section of its show. Here's an MP3 of Capital Regiment performing "New World Symphony" before the storm struck. Capital Regiment performs beneath a nasty approaching storm. The skies suddenly turned blue-green, and a harsh wind began blowing white and brown trash bags and other debris around the field. Capital Regiment played on. It was clear a storm was coming, but no one knew how soon it would pour. Some of the BOA kids leapt over the railing from the stands and ran for cover. Capital Regiment played on. Drum major Will Perdomo's shako blew off and landed under the judging table. Normally unflappable DCI field announcer Dan Potter shook his head in disbelief. Corps director Rick Bays stared down the clouds, then back at his corps. Capital Regiment played on. The audience that hadn't scattered began cheering wildly. Inspired by the storm, by the ravenously cheering BOA crowd and by a few of their instructors prowling the sidelines wearing defiant grins, Capital Regiment finished up its show. The storm thundered its approval. The audience screamed some more. Capital Regiment scattered quickly to the adjacent field house. Safe indoors, the drum line set up in an arc, and began a victorious cadence. The rest of the corps marched into place. 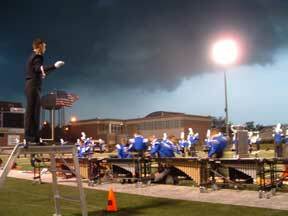 The audience in the field house went nuts -- 1,500 band students screamed at the corps that had stared into the very eye of the storm and made it blink. Capital Regiment had won over even Mother Nature. "It was a lot of fun but crazy out there! Everyone was counting and pushing really hard. It's all you can do in an element like that," said Kim Ngugen, a second-year guard member. Later in the evening, director Rick Bays said simply, "That was unbelievable." Before Capital Regiment's performance, unsuspecting drum major Perdomo said, "This is our first year as a Division I corps, so everyone is really excited and psyched about it. This is why we do it -- the performances and the crowd." Although the weather was threatening last night, serious conditions did not hit the area until well after the audience and performers were moved indoors. Our weather management, access to lightening measuring devices, various electronic media and a contact to a major airline meteorologist were all in place last evening. The safety of the fans and the participants is our NUMBER ONE concern always.